in a somewhat rare case of non-completionism, i played the first section of the original system shock before deciding to skip it (despite it being decently enjoyable) and move on to system shock 2 instead. system shock 2 was released onto steam about nine months ago, and it was good timing for me since it was around the time i was looking to play it. although i’ve been playing it in bursts since then, i’ve decided to call it quits more than 3/4ths of the way through b/c the game just got too damn repetitive for me. first, the good points. a reviewer at pcgamer.com called the game a “first-person sci-fi survival action RPG”, and the game does a good job of blending the genres. the RPG part is the more-unique aspect, esp. considering when it was released, and the game offers three branches to specialize in: weapons, hacking, and psi (i.e. magic). it quickly became apparent that while more intriguing, the psi branch was going to be the hardest to progress with, so i focused on weapons and hacking. the game is certainly atmospheric, and there’s a significant learning curve at the beginning. a poster at this random forum put it well when he (?) said, “The best scary games are those in which [the] player feels weak”, and the game definitely succeeds in starting you off feeling very, very weak. although initially frustrating, once i got over the hump i made steady progress and was able to enjoy the atmosphere and game mechanics more. a common complaint from that same forum was the unbelievability of the game telling you things like, “you can’t use a shotgun because you have no skill points in that”, but those kinds of restrictions are par for the course in any video game so they didn’t bother me too much. however, as with many games, from a modern perspective the game felt way overly padded to me. the game is set aboard a space station, and although it was designed to be realistic in terms of the amenities that would be needed in real life, searching through areas like living quarters gets to be incredibly tedious since the rooms look identical and there seems to be an endless number of them. the amount of enemy variety also thins out very quickly, although there’s some interesting alien weaponry that shows up later in the game, calling to mind some of the weapons from half-life, which preceded it by about nine months. it’s interesting to compare the two, and although i’m guessing the two were released so close together that half-life couldn’t have had much of a direct influence on it, the ending sections are somewhat similar. although system shock 2 definitely has its loyal fans, overall i would have to give the edge to half-life. although i found a fair amount of it to be frustrating, overall there was a good amount of variety that kept me playing through to the end. 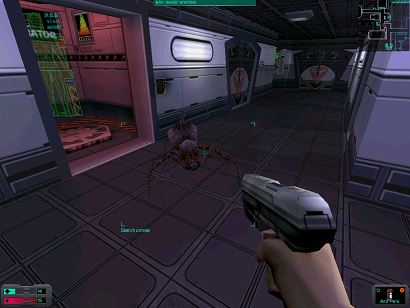 system shock 2 rides a line between being too fiddly (esp. with weapons breaking all the time) vs. being satisfyingly deep, but i felt that more often than not it fell too far on the wrong side of the line. it looks like its spiritual successor, bioshock, has a much better balance from what i’ve played of so far: although fans of this game seem to regard bioshock as a big dumbing down of system shock 2‘s gameplay, i, for one, am looking forward to a less frustrating system. – i really enjoyed watching a speedrun of half-life and seeing whole sections that took me hours go by in just a few minutes. here’s a nice speedrun of this game. – there doesn’t seem to be any shortage of walkthroughs for this game. this one, at sshock2.com, is useful, and for an even more-foolproof one, check out this one at visualwalkthroughs.com.